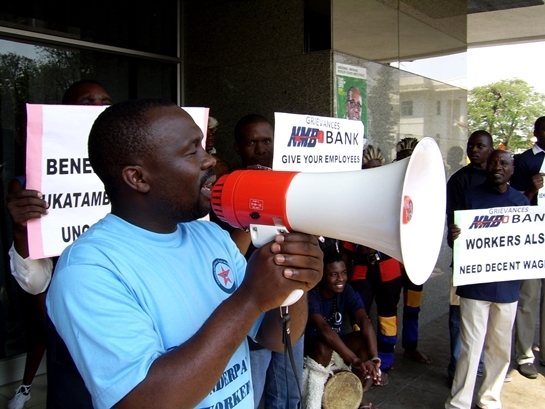 ZIMBABWE Banks and Allied Workers Union (Zibawu) will next week stage a demonstration in Harare against police's heavy-handedness in dealing with members of the public. The planned demonstration comes in the wake of Zibawu members being caught up in the disturbances that rocked Harare central business district when police, who were trying to evict vendors from the streets, reportedly ended up indiscriminately assaulting residents going about their business. In a letter to the officer commanding Harare Central, Zibawu said around 100 of its members will peacefully gather and demonstrate at Police General Headquarters on October 2 to register their complaints. "This action is to show our displeasure in the recent indiscriminate brutal assaults of citizens by the police within Harare CBD which resulted in our executive member being assaulted without reason as she was coming from work on the 21st of September 2018," said Zibawu in the letter also copied to the Zimbabwe Human Rights Commission and signed by secretary-general Peter Mutasa. "The trade union believes that police must be maintaining law and order, protecting and securing lives and not to act as a threat to the peace and life of the citizens. We intend to hand over a petition to the Commissioner-General (Godwin Matanga) and the Zimbabwe Human Rights Commission thereafter."